The transition from an arboreal lifestyle to a purely terrestrial one was never finished: some modern humans who live natural lifestyles in the forests of Earth still climb more or less like a chimpanzee, i.e. “walking” vertically. This seems more a matter of acquired flexibility of certain calf muscles than anything else (although I imagine that a small complexion, which reduces weight, may also help a lot). Emphasis is made therefore in that australopithecines like Lucy, who had clear anatomical adaption to walk like we do, could still be using trees almost at whim: there’s no such a binomial disjunctive between walking and climbing and wide compromises can be made. Vivek V. Venkataraman, Tree climbing and human evolution. PNAS, 2010. Open access → LINK [doi: 10.1073/pnas.1208717110]. Paleoanthropologists have long argued—often contentiously—about the climbing abilities of early hominins and whether a foot adapted to terrestrial bipedalism constrained regular access to trees. However, some modern humans climb tall trees routinely in pursuit of honey, fruit, and game, often without the aid of tools or support systems. Mortality and morbidity associated with facultative arboreality is expected to favor behaviors and anatomies that facilitate safe and efficient climbing. 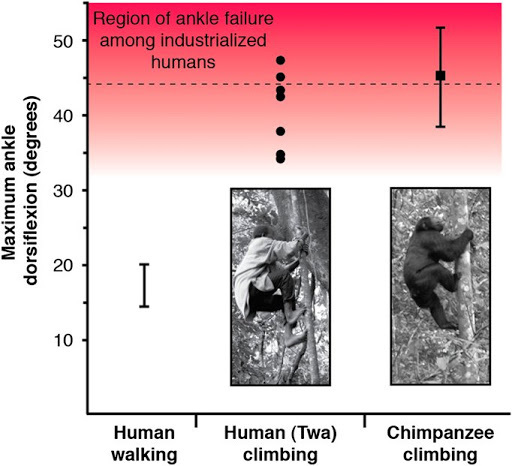 Here we show that Twa hunter–gatherers use extraordinary ankle dorsiflexion (>45°) during climbing, similar to the degree observed in wild chimpanzees. Although we did not detect a skeletal signature of dorsiflexion in museum specimens of climbing hunter–gatherers from the Ituri forest, we did find that climbing by the Twa is associated with longer fibers in the gastrocnemius muscle relative to those of neighboring, nonclimbing agriculturalists. This result suggests that a more excursive calf muscle facilitates climbing with a bipedally adapted ankle and foot by positioning the climber closer to the tree, and it might be among the mechanisms that allow hunter–gatherers to access the canopy safely. Given that we did not find a skeletal correlate for this observed behavior, our results imply that derived aspects of the hominin ankle associated with bipedalism remain compatible with vertical climbing and arboreal resource acquisition. Our findings challenge the persistent arboreal–terrestrial dichotomy that has informed behavioral reconstructions of fossil hominins and highlight the value of using modern humans as models for inferring the limits of hominin arboreality. See also: Science Daily. H/t Pileta[es].